Hardtuned Network is Australia’s #1 Automotive Lifestyle Network. Hardtuned Network has been purpose-designed to be a free information resource that offers effective advertising opportunities for vendors and manufacturers in the performance car industry. With over 500,000 people visiting our website a month we are the leading reference for automotive enthusiasts, and particulary performance car owners. 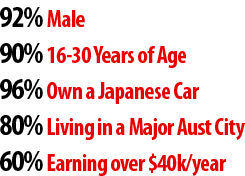 The predominant audience share for the Hard Tuned network is Australian, Male, and aged between 16 - 30, living in SA, NSW, Victoria and Queensland. Female readers account for 8% of traffic. Site content at present is limited to Australian interests, yet the Hard Tuned network reaches audiences across the globe, with 15% of our traffic coming from international subscribers, with affliated clubs formed in the USA, Europe, UK and Japan. The Hard Tuned Network's greatest asset is it’s community based “Web-2” structure, which means not only do we have 37,000+ members, we have 37,000+ editors & contributors. With our simple to use, yet extensive functionality, and open-speech policy* we encourage members to share, contibute and discuss topics, this interactivity making us the #1 network for automotive news and event coverage. With updates on current news events, motorsports, technical data & shows appearing real-time to the minute, many of our users choose us as their primary source of information for all their news & current affairs. Japanese Cars, Motorsports, High-Tech items & latest gadgets, Fitness, Music, DVD’s, Computers & Video Games, Social Events, Clubs, Parties, Fashion, Alcohol and Entertainment, Movies & Concerts. The most common form of advertising on the internet, Banners on the HardTuned Network ars sold in the industry standard measure of "banner impressions". We offer the larger "Leaderboard" dimensions of 728x90 pixels and generous allowances for file size in jpeg, Animated gif, and swf flash formats. For automated auto-bill subscription packages, please click the links below, to negotiate a corporate partnership (advertising over $2,000/month), please contact Loz. The amount of times your banner is displayed is measured in "impressions". An Impression is counted every time your advert appears on a persons screen that is viewing the website. This guarentees our advertisers receive a fair and exact amount of exposure to their customers, unlike television and print where the actual viewing demographics are only estimations. Artwork costs are not included in pricing framework, if you do not have banners developed we can recommend design companies to help you with your advertising design needs. The subscription service will Autobill your credit card every month, you may cancel at any time by logging into PayPal and clicking "Cancel Subscription" or simply by contacting Loz. The "Forum Trader" system was the initial foundation of advertising on nissansilvia.com and we have decided to continue with this form of advertising accross all the domains within the Hard Tuned network. The system described above offers Hard Tuned sponsors the ability to manage and promote their business via self maintained areas which become 'live' online catalogues of their respective products and services on offer, with members communicating and purchasing directly off the site through personal message, email or phone. This style of advertising creates a highly competitive marketplace however is cost effective and can yeild excellent results if the shop is willing to devote a member of their staff to update, maintain, and handle queries on an ongoing basis. to sign up for this form of advertising, you must be logged into the forum with a registered username and password (free).